Dr Hiba Amin is originally from London where she completed extensive postgraduate training since graduating from the University of Glasgow in 2003. 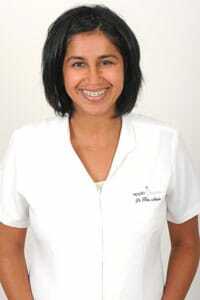 Hiba’s extensive skills and knowledge enable her to provide the highest level of care to our patients. She has a particular interest in occlusion and the treatment of bite and jaw joint problems, root canal therapy, crowns and bridges, full mouth rehabilitations and dental implant placement. Dr Amin completed her Masters in Conservative Dentistry at the renowned Eastman Dental Institute in London, to complement her Diploma in Restorative Dentistry and her knowledge gained from attending courses all over the world. Over the years, Dr Amin’s commitment to higher education has only grown and she continues to expand her clinical knowledge so she can provide her patients with the most innovative and appropriate dental care. While Dr Amin loves cosmetic dentistry and enjoys seeing the pleasure this can bring to people, it is especially important to her that she creates healthy and functional smiles, using only the best techniques and materials for optimal outcomes. As an extremely gentle dentist, Dr Amin particularly likes helping more nervous patients gain the confidence they need to receive essential dental care. Dr Amin is especially passionate about preventative dental care and firmly believes a holistic approach is the best way to maintain good dental and general health. Since joining Apple Dental in 2009, Hiba has enjoyed developing great relationships with her patients and as a mum, she always loves meeting new families in the area. With her friendly and approachable manner, Hiba has quickly become an integral part of the Apple Dental team, delivering the highest quality dentistry in the relaxed environment of our Lane Cove dental practice. Book an appointment online or call us on (02) 9420 5050. Our practice is located at 1 Finlayson St, Lane Cove NSW 2066.